This may sound cheesy but I miss home. I miss my parents. I know they are just a bus ride away but absence makes the heart grow fonder. You don't really know what you have until you move away and become a grown up and have to do everything on your own. I miss helping my mom in the kitchen. I was her little helper...regardless of how old I got, that will always be the case. After work, I stopped by the local vegetable market and bought some Chinese eggplant and fresh coriander. Coriander, garlic, ginger and onions are a must in South Indian cooking. I knew exactly what I was going to do with the eggplant. 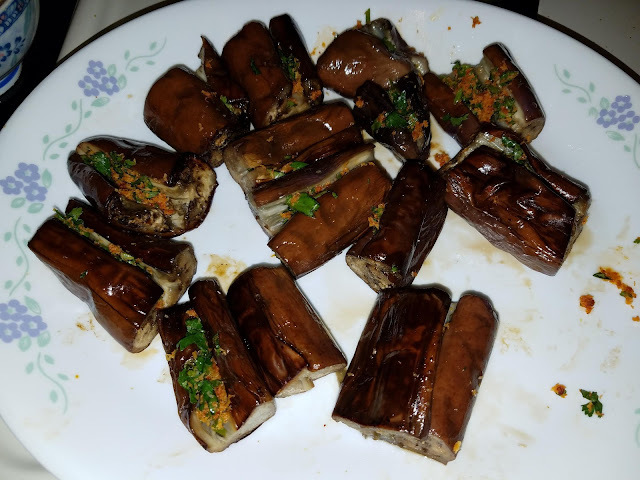 It's one of my favorite ways to eat this type of eggplant and it's easy to make, as per my mom. I gave it a try last night and as you can see from the picture below, it came out well. I didn't burn it or over season it. The best part was that my husband really liked it. He ate more than half of the pieces in this plate. I am definitely going to save this recipe and make it as often as I can. Remove the stalk from the eggplants and then slit them longitudinally. (Caution: do not slit all the way through the eggplant so that it splits into two pieces.) Then rub salt lengthwise and apply oil on the outer surface with your fingers. 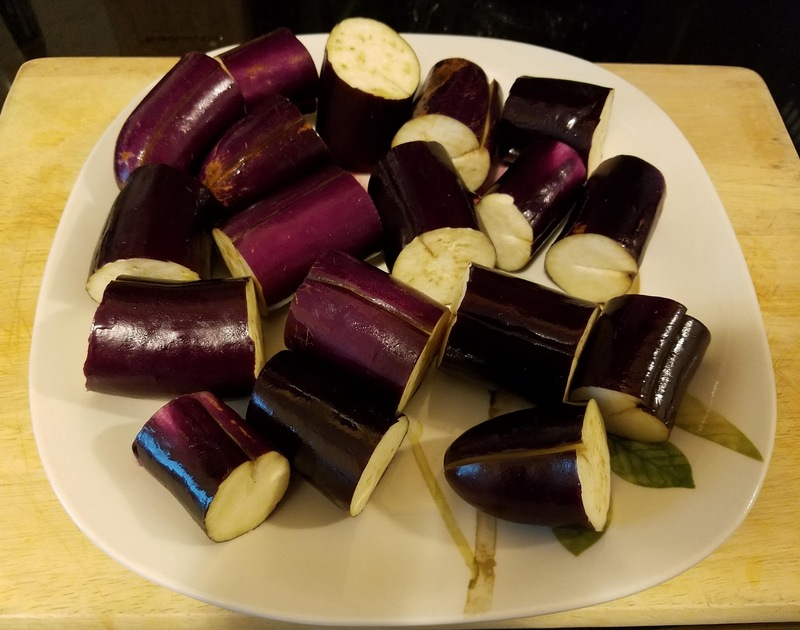 Next cut each eggplant into 3 inches long. Arrange the eggplant pieces on a microwaveable plate and microwave them with a cover for 4 minutes or until soft. Add tablespoon of oil to a medium saute pan on low-medium heat. 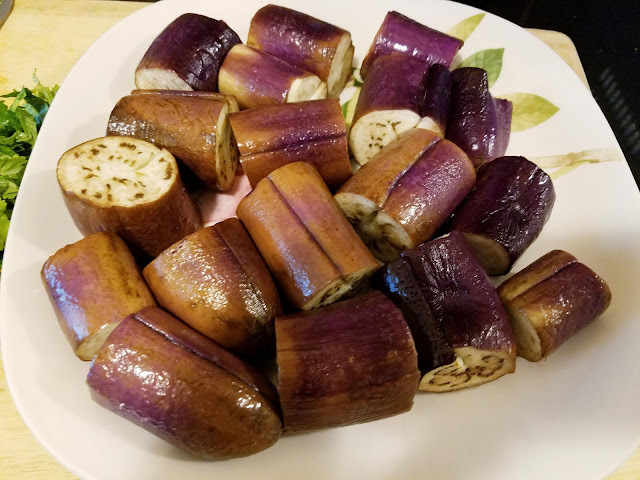 Transfer the eggplant pieces to the heated pan and fry up to 5 minutes or until all the pieces have cooked through and browned. Remove the pieces from heat and place in a plate to cool. Scoop the coconut powder in a small cup, sprinkle some water and microwave for 15 seconds to re-hydrate it. 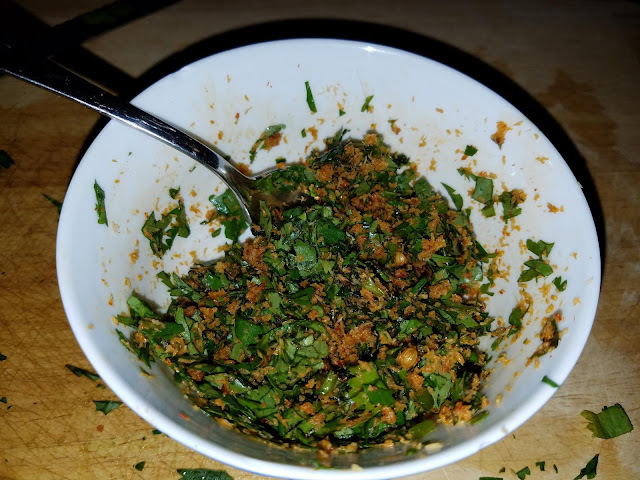 Mix together the coconut powder, 1/2 teaspoon salt, dry garlic chutney, and fresh coriander. Adjust salt per taste. Stuff a little bit of this mixture in between the slit of each eggplant piece. The stuffed eggplant is ready to be served. 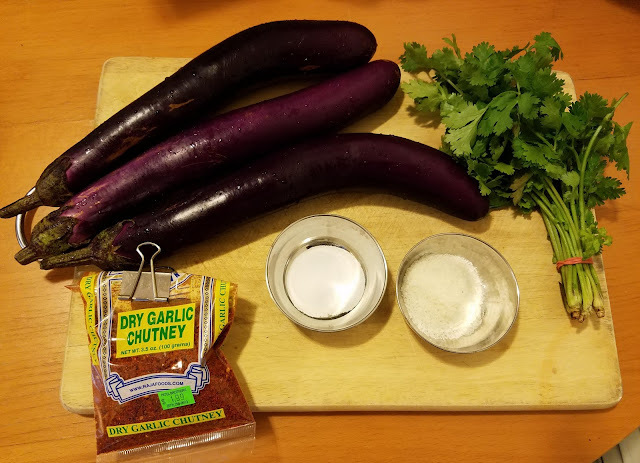 I love eating the eggplant with warm plain white rice mixed with ghee (or clarified butter). The flavor combinations from the spices and sweetness of the eggplant complement well with the rice. I feel right at "home". - You can use freshly grated coconut instead of dry coconut powder. - The dry garlic chutney is optional. You can also use combination of coconut powder, salt and chili powder. What dish reminds you of home? Leave us a comment. We love hearing from our readers.